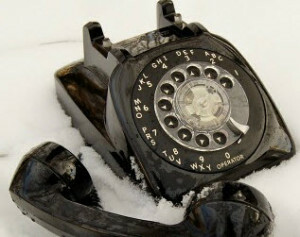 It is often said that millennials hate cold calls. Doesn’t everyone? But introducing your media or advertising service to new customers is required for sales growth. Most media companies know that they must replace about 30% of their accounts from the previous year to stay even. How can you do that without conquering new accounts? How can we square our aversion to rejection, and customers’ aversion to connecting with an unknown company, with the All-American value of sales growth? The solution is smart calls. When you reach out today, which should still be done by phone with an immediate email follow-up, you must have a smart message. Your opening lines, whether your prospect answers the phone or you leave a phone message, must be smartly specific to that prospect and that business. When you can cite a specific data point about that business, the prospects ears immediately perk up. It’s a data-driven version of a warm call. It’s the sales-call version of targeted creative. Right message, right time, bingo! Smart calls are not self-centered or product-or-service-centered, they are prospect-centered. How will you equip yourself to know on-point information on many prospective customers at the same time? Use detailed industry-wide or category-wide research. That data will apply to a whole category of prospects. For instance; if you can say to a liquor advertiser, 23% of restaurant customers who order cocktails consult their mobile phone social media before they visit a restaurant, it will be very hard for a prospect not to decide they should engage with you. And when you are trying to break a major account that is very high priority, invest the time to research to be able to cite company or brand specific metrics. 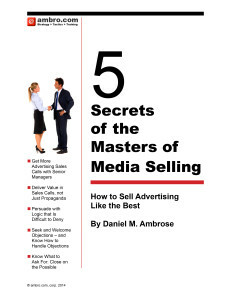 Learn more about how to engage, persuade and close advertising-media sales at the highest level, winning more business and greater market share, by joining the Masters of Media Selling Seminars. Or download the 5 secrets of champion ad-sales people and sign up for my email newsletter to learn about new opportunities. Its not how to sell….its help them buy..